Ross McCrorie feels 'honoured' to captain Scotland's Under-21 side. Picture: SNS. Rangers youngster Ross McCrorie believes Lee Wallace is the perfect inspiration as he prepares to captain Scotland Under-21s tonight despite his problems at Ibrox. The Ibrox midfielder was handed the armband for the first time ahead of Scot Gemmill’s side’s 3-0 win against Andorra last week. McCrorie will skipper the young Scots again tonight in Doetinchem in a game in which Scotland realistically must avoid defeat to stay in the hunt for a European Championship play-off place. 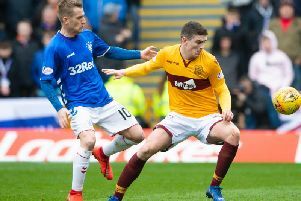 The midfielder has listened to Rangers outcast Wallace, whose future at the club is unclear after he won his appeal over disciplinary action by the club. He said: “It’s an honour to be captain. I didn’t really expect it. I found out right before the game. I’ve been captain for the different age groups, so getting the Under-21s tops it off. It’s brilliant for me. “The big influence for me was Lee Wallace. When I first went into the first team at 16 to train with them he was captain. He took me under his wing, always spoke to me. He just kept me involved and I could see his leadership skills straight away. I took little bits from that. “When I first went up I was dead quiet, a bit nervous. But when Lee spoke to me the nerves were gone straight away. He made me feel a part of it. As a captain there might be boys who don’t get involved so much so you need to make sure they feel part of the group. McCrorie was labelled as Scotland’s best-ever defender-in-waiting by previous Rangers manager Pedro Caixinha. But he sees his future as a holding midfielder and it helps that three of his coaches – Steven Gerrard, Gary McAllister and Gemmill all played in that role. He said: “I came up through the youth teams playing centre-half, [but] right now I’ve been playing centre midfield and it’s where I’ve been playing best. I felt it when Graeme Murty was the manager, It started when Pedro Caixinha played me there against St Johnstone. I’d played for the youth teams in centre mid and hadn’t been so keen on it. I didn’t like playing out of position. But it’s grown on me and it’s maybe more of my natural position. “Steven Gerrard played all the three different positions in midfield so he and Gary McAllister can help me a lot. It’s great to have them there. I think my best position is centre midfield. “The first day they spoke to me in the gym and asked me about my favourite position. I said it was more central midfield and it’s where I’ve played ever since. They’ve really helped, even in training with little bits like positioning. Meanwhile, Gemmill reports the Netherlands have upped their game from when Scotland shocked them with a 2-0 win in Paisley last year.